Valentine’s Day is next week so all this week on my Instagram page I’m exploring fun food and fun activities as part of my Make Eat Explore theme. While on a recent cupboard raid I came across two packets of Angel Delight that had been forgotten about and were slightly past their best before date. Instantly I knew they would make a great sensory experience. 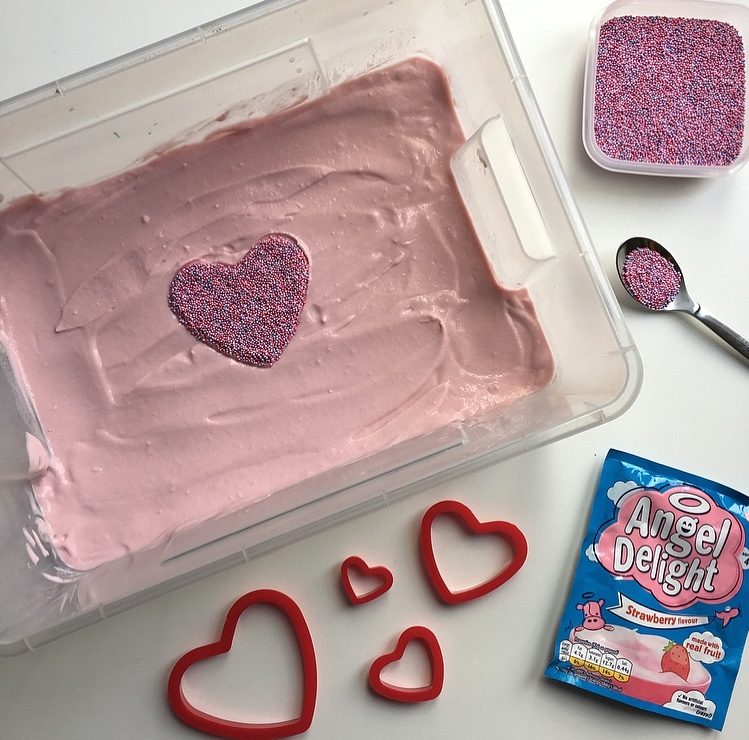 If you’ve never heard of Angel Delight it’s a powder that once whisked with some milk makes a sweet mousse like dessert. You just need to leave it in the fridge for 5/10 minutes to set and then you are good to go. Angel Delight is available in most big supermarkets. 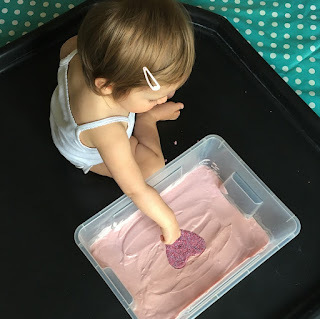 Instead of using it as a dessert though I wanted to use it as a valentines sensory play experience. I used two packets and made it up following the instructions on the packet. Once it had chilled for 10 minutes I then transferred it into a bigger tub to explore. You could keep it in a bowl though. It has a lovely thick texture and is very soft to touch. Once on your skin though it is very sticky. As my toddler is 16 months old she still very much explores things with her mouth so taste safe sensory experiences are a must. 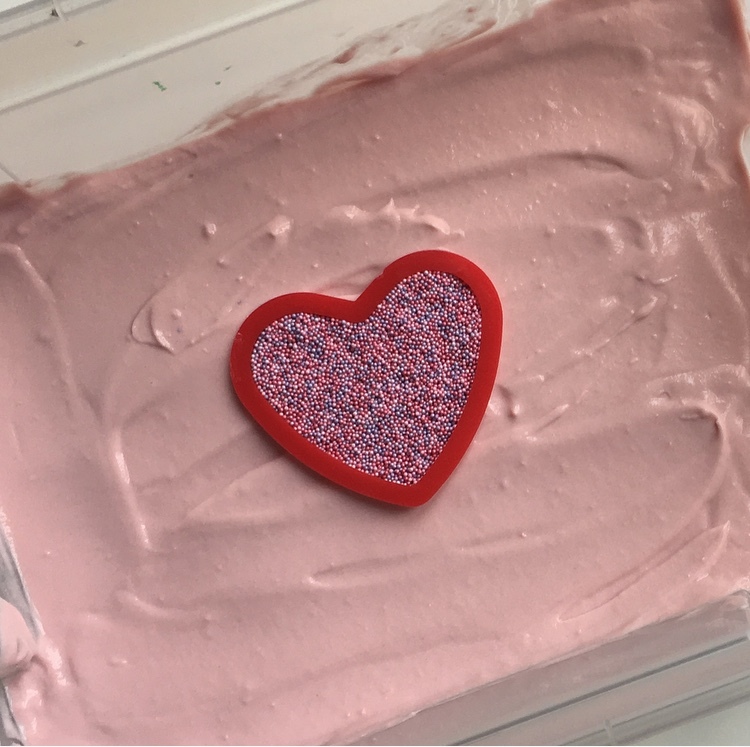 I then added a sprinkle heart using a cookie cutter as the outline. You could add anything you like such as yogurt, jam, coconut or chia seeds. Just use whatever you have in the cupboard to make it taste safe. You could perhaps add blocks, confetti or hearts for older children to discover. I set this up on our tuff spot tray as it’s a great resource for containing any mess. 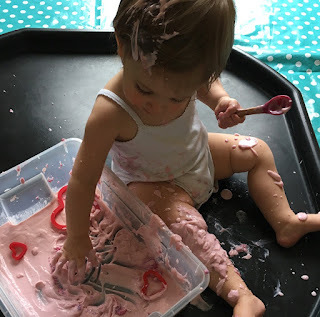 At first she was very cautious about exploring the Angel Delight and would only lightly touch the sprinkles. As she progressed with the play and from some additional spoons and cookie cutters she got more adventurous and was more confident about touching it. She did eat some which was absolutely fine but was happier picking it up and dropping it on her legs. As I was expecting this to be messy I had a bath and clean clothes ready. Once she was cleaned up I just hosed down the tray and tuff spot outside so the clean up wasn’t too time consuming.